Well, as much as I have LOVED working on my quilt squares the past week or so… I’m ready for something different! 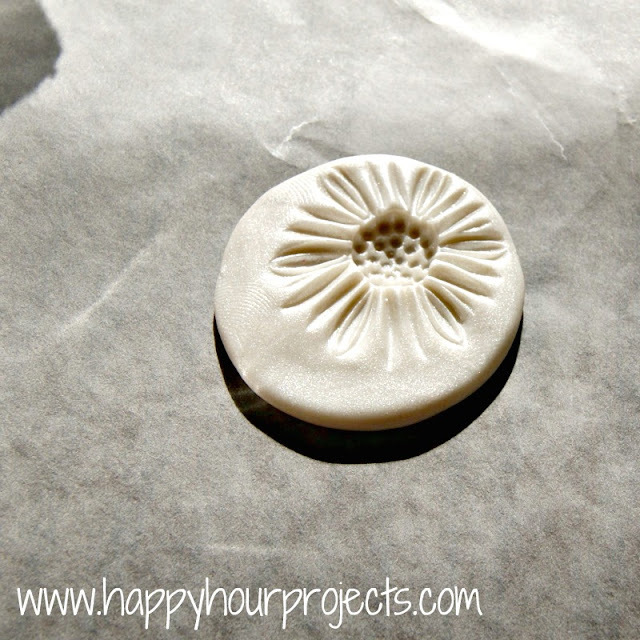 I have been enjoying the effect of stamping on polymer clay recently, so I started playing around with some other items in my stash to create different looks. 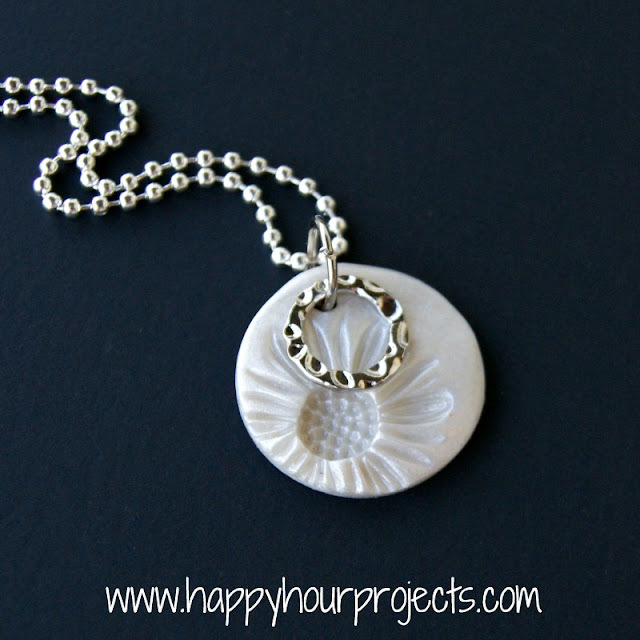 I made this pendant by using a cabochon as a stamp, and I love how it turned out! 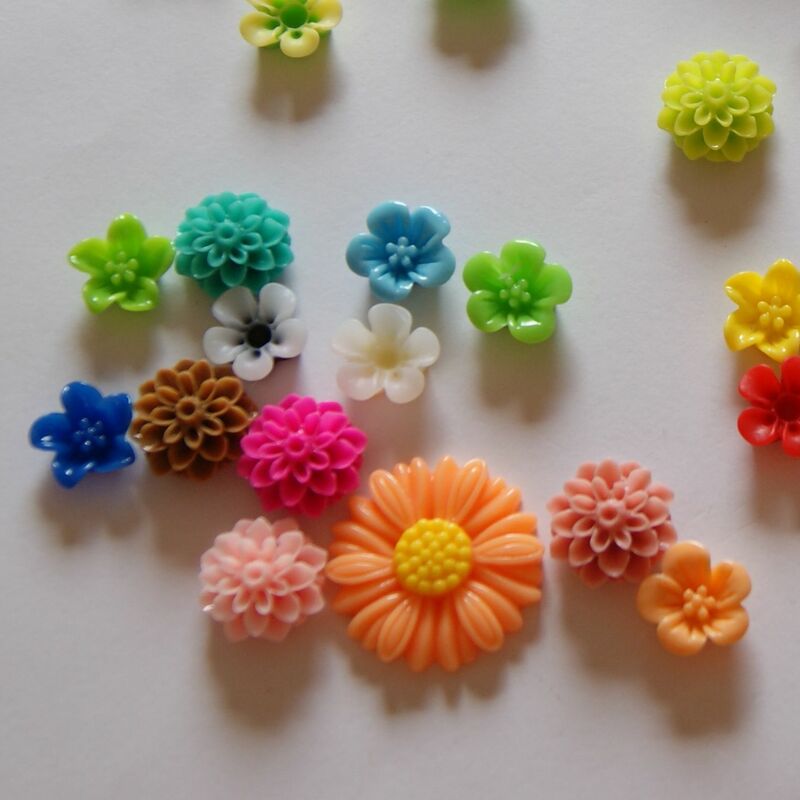 If you haven’t worked with polymer clay before… be warned, it’s really addictive. 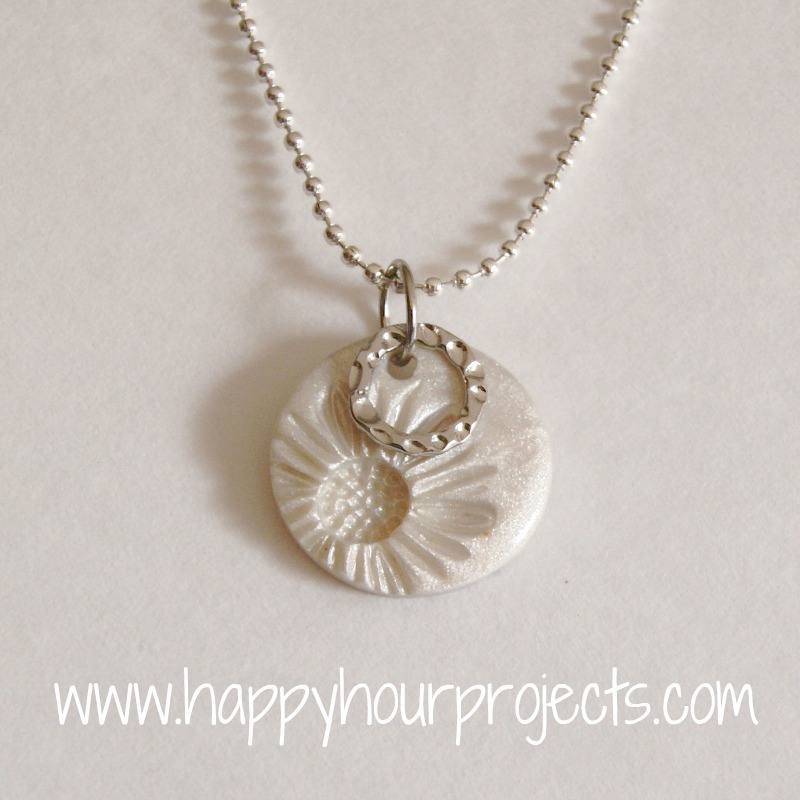 :) It’s inexpensive, easy to work with, and for small projects like jewelry, one package really goes a long way! Next time I have time I’m going to have to add a navigation button for polymer play projects (if you’re looking for something in the meantime, you can search for projects tagged Polymer Clay). Roller – a dowel would work well if you don’t have a clay roller. Cutters – either for clay, or for cookies – as long as you don’t use them for food after you’ve used them on clay. Anything jewelry-sized will work. 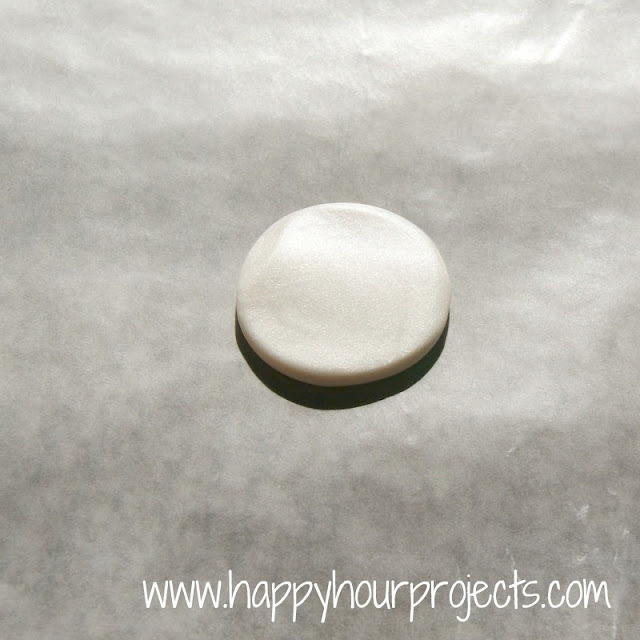 First, roll your clay into a ball, and then roll it out with your roller to 1/4″ thick. I rolled mine out on wax paper, and then transferred the whole sheet onto my baking sheet to put in the oven. It protects all the surfaces and makes moving it easy. Parchment paper would accomplish the same thing. Pick your cabochon/button/etc. I had all these lovely ones to choose from in my last Pick Your Plum goodie box I ordered. Press it into your clay. Experiment with whether you like a deep or shallow impression. I was going for a bolder look, so I pressed deep. I decided I liked that off-center look. So when I used my little round cutter, I made it even more off-center. You want to stamp first and then cut, because the stamping will squish your clay. If you cut it first, it will end up misshapen. Although, if you enjpy that sort of look – feel free to try it out. There are really no rules here! 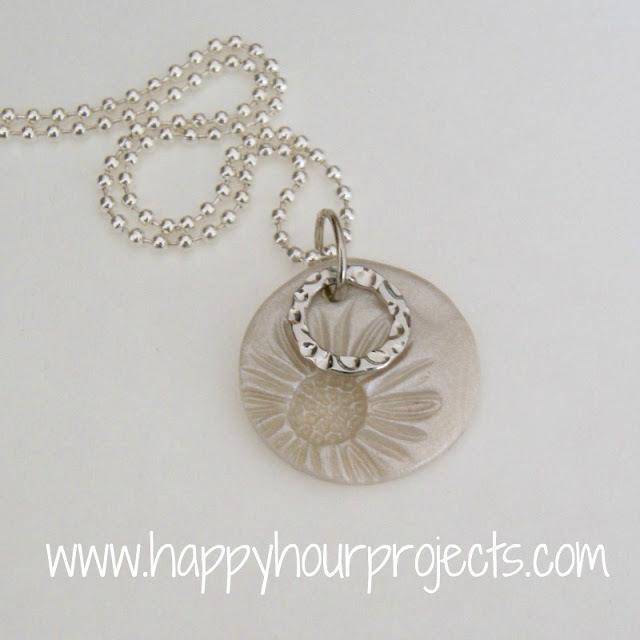 I used a toothpick to poke a hole in my pendant, so I could add a jump ring. Now, bake it in the oven according to the package directions. Different brands and formulas may have different directions, so be sure to do what your package says. Generally, though, a 1/4″ thick pendant is going to bake for 30 minutes. Once it’s done and cooled, brush a coat of gloss glaze on it. This will help protect it, and make it shiny. You could probably skip this step if you like a matte-finish look, but to me that looks unfinished. You’ll note I made two – I couldn’t decide whether I wanted to glue a bail on the back of it, or put it on a jump ring, so I made one with a hole and one without. I decided it looked a little plain on its own, so I raided my bits-and-pieces and paired this ring with it. That’s why I opted for the jump ring. It makes for a fun, summery piece! What kinds of experiments have you been working on lately? I love your polymer craft works and I really want to try them out. But I have yet work much with clay before, can I know what brand and type of silver clay are you using for reference because some I saw looks darker than yours and that is not what I want. This is Sculpey Premo, I’m not sure what the color is called but it is a really light silver, like a shimmery white rather than a gray tone. I like it a lot, I use it for a lot of my projects. I love this project and plan to try and duplicate it. Were those actually buttons you impressed into the clay? Really very nice. 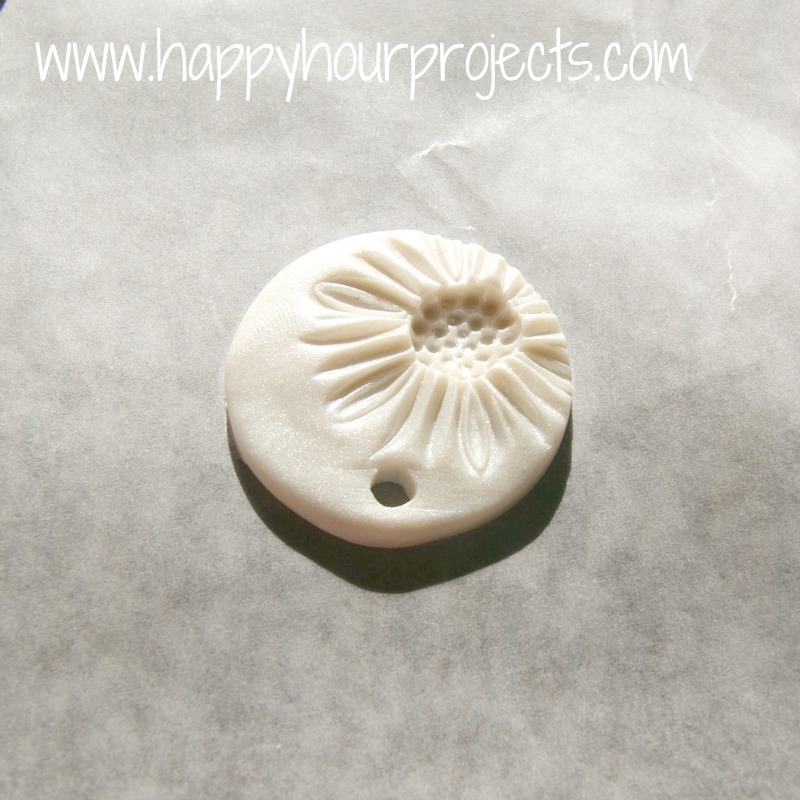 I used cabochons, which are very similar to buttons but the backs are flat to adhere to things. You can use buttons though or really anything you like to look or texture of. Omigosh! So simple, and just beautiful! I love this! I have a friend that is crazy about sunflowers and this would be a perfect little gift to make for her =) Thanks for sharing! love love LOVE this!! Pinning it right away. 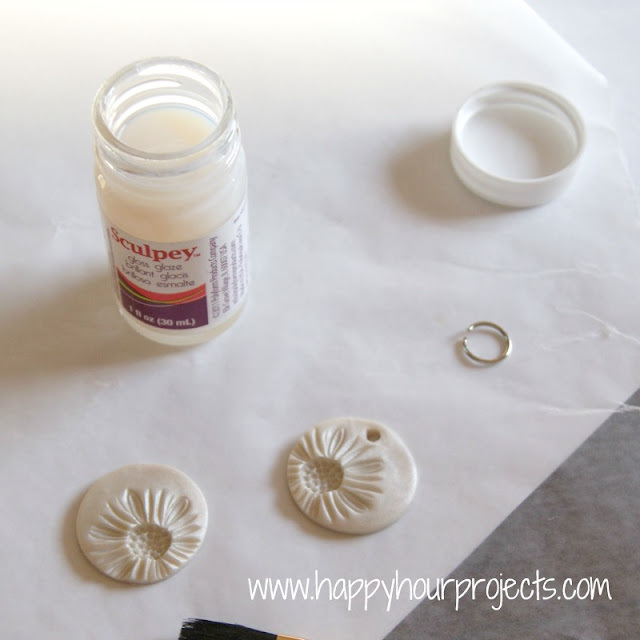 I have that same flower set from PYP…so going to try this if I can find some clay in my stash! So cute! I love the sparkle of it. Beautiful! Thanks for sharing at the Pomp Party! Pinning! Way cute, and it looks great off center like that! Thanks for sharing at The Fun In Functional! I love it! It's gorgeous! Thanks for sharing. Wow, that is totally cute! I might actually be able to do that! I love the off center look; it's so original. That is seriously so beautiful! Cute as a button! I really love the shimmer finish on it. I LOVE this idea! Thank you so much for sharing it with us! So cute!! I made something similar recently, but I didn't use the sculpty glaze, I used Lisa Pavelka's Magic Glos (https://www.lisapavelka.com/Magic-Glos.asp) It gives a really good shine and gives it kind of a doming effect, very cool. And you just have to set it in the sun to set it. I love the results, you should try it!!! this is great!!! I love it.. I agree about the off-centered look. This is really sweet. I like the off centered look, too!